OK. so whats the point? Thou shalt not steal is a religious belief. 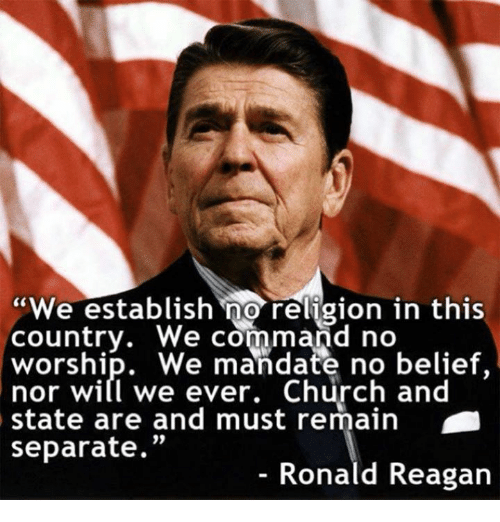 What reagan said about the left. What about people who are responsible and merely convivial? I agree. There are plenty of secular reasons to celebrate and have holidays. 1. OK. so whats the point? And that the state has no business trying to establish a state church by writing laws based on religious belief. It works both ways, it also protects the Church from the State as well as protect the State from the Church. It had to do with State religions in Europe. For example, UK's 1689 British Bill of Rights protects only a Protestant's right to own a weapon for self defense. 13. Thou shalt not steal is a religious belief. should we revoke theft as a crime??? Should we do away with the 5 day work week? Its establishment was based on a day of rest for Christians and thyen Jews? 4. What reagan said about the left.
" they know so much that just isn't so"." History clearly shows what happens when religious leaders have power. The denial of human rights. Right down to murder and genocide. They still try in this country with their little 'religious freedom' to discriminate, but that's all they got left and it's going away fast. We can never give fundy religious sects any measurable power again. that it is every good Christian's duty to punch out Jerry Falwell. maybe the most important one...is that it's OK to believe something as long as one isn't trying to force one's beliefs on other people..
For example, I hate alcohol and would just as soon see it banned. But that wouldn't be fair to people who enjoy beer, wine, vodka, etc. So my only request is that drunks and alcoholics stay away from me. 10. What about people who are responsible and merely convivial? They can pass proclamations urging everyone to celebrate the death and REsurrection of Jesus- as long as they do not try to make it mandatory by establishing laws towards those ends! and holiday overtime pay for government workers and lets see how separate they are. 12. I agree. There are plenty of secular reasons to celebrate and have holidays.